I’m still a novice when it comes to yeast breads, but this week I had a small victory. My pita bread puffed up! I’ve made pita before, but in the past it ‘s always been the flat type with air bubbles here and there. It tasted okay, but I wasn’t getting a pocket and couldn’t figure out why. This week I tried a couple of new recipes and started combining techniques. What I realized in the end was the key to getting my dough to puff was a fiery hot cast iron skillet and a 500 degree oven. Here’s the recipe I used. This can be done with a pizza stone, but I don’t have one anymore and had to use the cast iron skillet. It turned out the cast iron skillet was easier to work with and seems to have gotten hotter than my previous stones. The drawback to a cast iron skillet is that you have to cook the pitas one at a time, but seeing that each one takes only about 3 minutes, it’s no big deal. Update: I don’t know if anyone is using this recipe but me, but for anyone interested I’ve come up with a new method for baking the pitas and have revised the directions slightly. In short, you bake the pita dough on pieces of parchment. 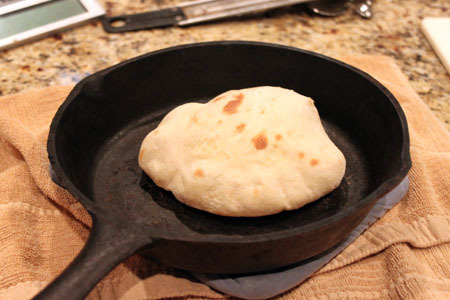 Pita bread that really puffs up into pockets when cooked at a high heat. Put the water in bowl of a stand mixer. Add yeast and stir to dissolve. Add sugar, salt and flour. Stir well. Dough should be a little sticky. Using dough hook, knead for about 5 minutes or until you have a smooth and elastic dough. After kneading, it will be smooth and elastic and a tiny bit slippery. Rub a second bowl with the olive oil, transfer dough to oily bowl, roll dough around in the bowl to coat with oil. Cover with plastic wrap and let it rise in a warm place until doubled in bulk (an hour). Punch down dough and shape dough into 6 rounds (mine were more like gobs, but not too ridiculously sticky). Set the rounds on a parchment lined cookie sheet to rest for about 15 minutes. Alternatively, set each round on a small square of parchment paper (about 6 inches). If using this method, you may be able to skip any extra flour and just rely on the oiliness of the dough. Meanwhile, put a cast-iron skillet in the oven and preheat the oven to 500 degrees F. While oven preheats, (and after dough has rested) take one of the dough gobs, and shape it into about a 5 inch round (Try for an even thickness) on a surface lightly coated with flour. Use just enough flour to keep it from sticking. If using the alternate method with individual pieces of parchment, take one of your dough rounds that you've set on a piece of parchment, press it into a 5 inch round right on the parchment, then lift the parchment and flip the pressed dough piece right down onto the hot skillet. Put the skillet with the dough, parchment still sticking to the top, right in the oven and set timer for 5 minutes. After 3 minutes, very carefully pull the parchment off the cooked pita, flip it and cook for another 2 minutes. With a couple of hot pads, carefully remove the hot skillet from the oven and set on another hot pad. Transfer the dough round to the hot skillet trying your best to keep it in its 5 inch (ish) circle. Quickly put the skillet back in the oven and cook for 3-5 minutes. My pitas took 3 minutes. Repeat with remaining 5 pitas. Makes 6 pitas. My pitas seem to puff up more when I use all-purpose flour. Also, if using quick rise or instant yeast, add the yeast with the flour and have the water between 120 and 130 degrees F.
I’m in! Looks awesome. And Fuzz’s smile sold me even if they didn’t look as good as they do. 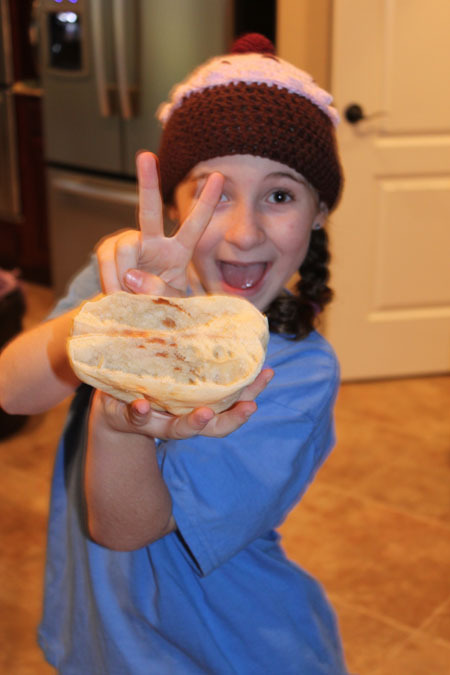 Maggie, you should try making your pizza dough into pita. Maybe it will puff up! What’s strange is that these are almost the exact same proportions of ingredients for my quick pizza dough! I think I use 2 Tbs oil and put it together in a different order. But otherwise same stuff! Strange! Those are perfect! I use the pizza stone and turn the oven up as high as it goes–550. I don’t make them that often, but I do think it’s worth it when I do. 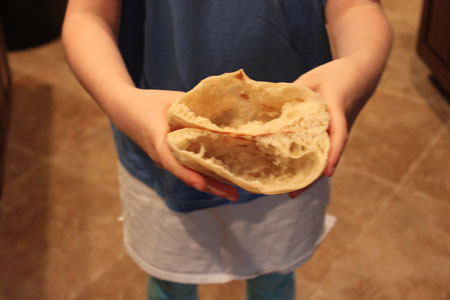 I have been meaning to make my own pita bread- this recipe looks fantastic! I’ve never had a fresh pita-I’m afraid once I have one, I’ll never be able to eat the card-boardy pita’s again. I have Sabra garlic hummus in the fridge right now waiting for some pita and some Mah Jongg players to eat it!!! On another note, I posted my experiment with your BB pecan pie on my new, under construction blog. Can’t figure out how to get two pictures in the same post…oh well!! Soon I will have lots of time to figure it out! Cute cupcake beanie! I love pita bread so I think I’m going to have to try this recipe. I love pitas but have never made them, i think i am too scared to try but it is worth a shot! If you don’t have a pizza stone, you can use unglazed quarry tiles. I have 4 that fit and take up most of one oven rack. I just put a piece of parchment paper down on top of them, due to the creases. I’m very impressed with the pocket! I’ve made various flatbread but have never had pita bread puff up that well. I never though to cook them in the oven, though, I’ve just done them on the stove top. I’ll give it a try, I’m sure homemade tastes much better than those kangaroo pita they sell at the grocery store and would be a lot less expensive than at the Lebanese restaurant. I have had good luck with pita bread by replacing the stone with doubled up cookie sheets that get put in the oven and preheated. If the dough is the consistency of an ear the handling works best; rolling it into a ball, then gently flouring it and rolling it into a circle. I hope you will continue your yeast explorations. I really enjoy your blog! WOW! you did have good luck with those. they look perfect! man those would be so good with fresh hummus. i bet using the cast iron gave it a better crust you know? I can’t wait to try this, last time I made pitas they only had little bubbles that I couldn’t fit anything in. Thanks for sharing! I’ve had the dumbest luck making pita bread. And, now that I’ve said that my pita bread will probably always be flat. haha!